Scoundrel - The Chip's Challenge Wiki - The Chip's Challenge Database that anyone can edit! Scoundrel is the 60th level in Chip's Challenge 1. 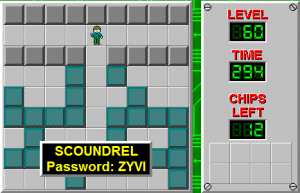 Scoundrel is primarily a large maze of blue walls, with a hint of monster dodging and a bit of deception. In Lynx, the biggest deception is the two unreachable chips behind the recessed wall, which could trap an unsuspecting player. In MS, however, there is a much more notable, but unintended, trick; just walk to the bottom of the level, step on the random force floor, and continue to do so until it takes Chip south, allowing a boosting override >R and winning in as little as 6 seconds. Due to the differences in how stepping off force floors works in Lynx, this 6 second solution is not possible; but interestingly, it does work in the Steam re-release, and also requires far less luck to pull off, as the random force floors are not actually random in Lynx and Steam. For the 233 no boost route, which is also the 232 Lynx route, see the second solution below. This route will take Chip through all the blue walls to collect several keys which move through several stages, and then down to the southern areas for the remaining chips. 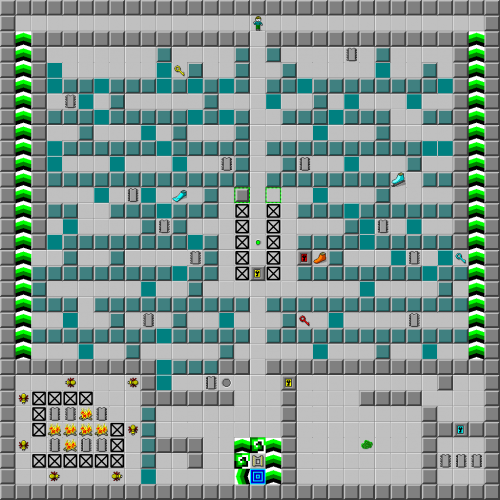 The flippers are extra, as there is not a single water tile in the level, while other items are unreachable or trap Chip inside blue walls. Additionally, there is also one extra chip - 13 chips can be safely collected, but only 12 are required. For the fastest route, the chip at (14, 10) is the one that must be left behind. The 288.0 route given is not the absolute quickest route possible; a 288.6 route would involve Chip stepping D onto the top random force floor, then moving >L DR into the exit. As this is notably more difficult without adding any seconds, it is not deemed notable to record in an AVI; this can, however, be watched at the public TWS. Chip hits the ice and decides to chill out. Then he runs into a fake wall and turns the maze into a thrash-a-thon!